An explosive homage to SNES-era platformers mixed with a modern physics-puzzle twist, Explodemon is non-stop action mayhem like you’ve never seen before. 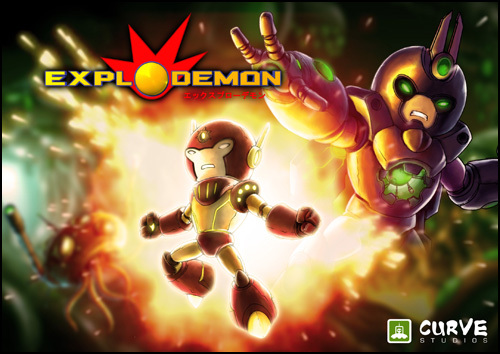 Players use Explodemon’s self-destructive nature to combat enemies and fly through the air, all the while solving a huge variety of physics-based puzzles (and, naturally, causing incalculable collateral damage). When the peaceful planet of Nibia is attacked by the malicious Vortex forces, the fate of the star system is thrust into the one pair of hands it shouldn’t be: the malfunctioning Guardian robot Explodemon. Featuring 12 huge levels of pulse-pounding platforming, a deep control system, devastatingly up-close-and-personal combat, upgradable special abilities, comic-book style cutscenes and a story that’ll make you giggle, cry, or simply sigh with indifference, Explodemon isn’t your average game. No way. It’s above average, at least. No, wait – so way above average that it’s pure awesome. That’s more like it. Explodemon! is unrelenting, hard-core brain-tickling action for those who grew up playing platformers, as well as those who’ll discover just how awesome they were.